Free tree lighting ceremonies in Boston. Nov.28 (7:30pm) Fanuiel Hall Tree Lighting A special preview of the all new Holiday Blink!, tune into WBZ-TV on Tuesday, November 28 at 7:30 p.m. for a live broadcast of the Faneuil Hall Holiday Spectacular. Friday, Nov. 24, 5 p.m., Macy's Boston outside on Summer Street, Boston, macys.com. Harvard Square - Saturday, Nov. 25, 4-6:30 p.m., The Charles Hotel harvardsquare.com. Nov. 25 (3 p.m.) - Holiday Tree Lighting Roslindale Village. Nov. 27 (5 p.m.) - Copley Square Tree Lighting with the mayor, Santa, and chorus. Nov. 30 (6 p.m.) - Boston Common Tree Lighting has the mayor, Santa, and fireworks. Nov. 30 (8:30 p.m.) - Commonwealth Avenue Mall Lighting. 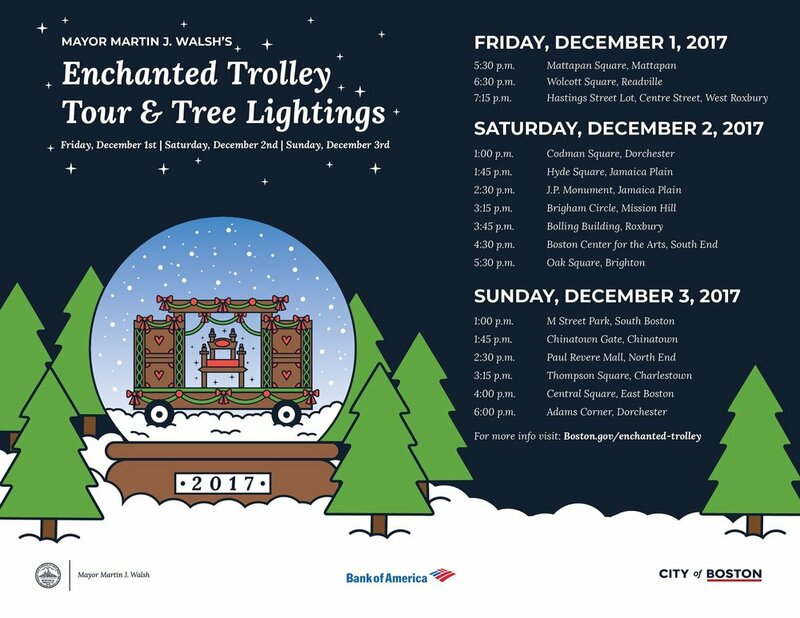 Dec. 1-3 Mayor’s 2017 Enchanted Trolley Tour - times & locations vary, boston.gov.